All SC4 library online resources are accessible from off campus. 2. SC4 Portal Password (same password you use to log into SC4 computers, the SC4 Portal, and your SC4 email). The login screen should look similar to the image below. Successful login will redirect you to the library resource. The login session is good for the duration of your browser session, but may time out after 30 minutes of inactivity. Access to off campus resources via SC4 ID# and Skippers One Card Barcode will remain available until May 5, 2018. 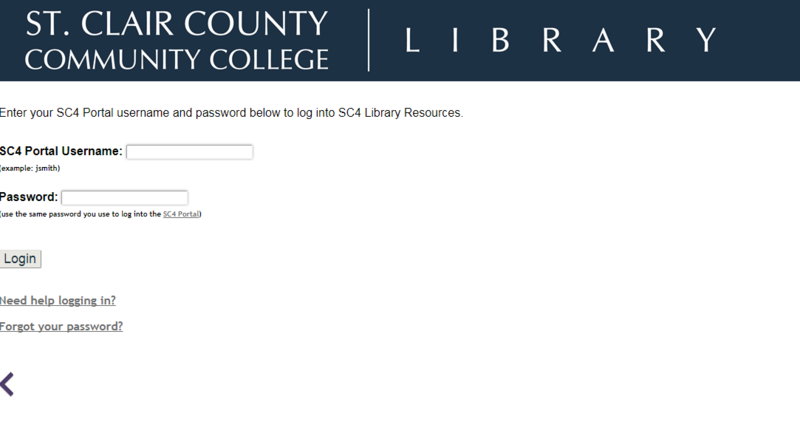 To access library resources using these credentials, enter your SC4 ID in the SC4 Portal Username field, and your Skippers OneCard barcode in the Password field. SC4 Library's off-campus access is compatible with all major web browsers (Internet Explorer, Firefox, Chrome, Safari) and is accessible via computer, tablet or mobile device. Be sure to set your browser to accept cookies. Are you using the correct username/password combination? Are you a current student or employee? Only current students, staff, and faculty may access SC4 digital resources from off campus. If you are a student and are not currently registered for any classes, your access is suspended until your next registered term.